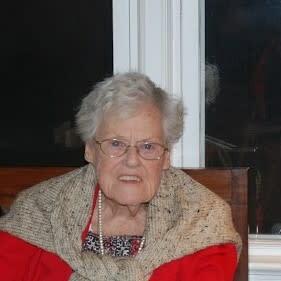 Maureen Morrison (McKee) 97 of Fair Lawn, NJ passed away on Saturday, July 14, 2018. Born in Glasgow, Scotland she was raised in Irvington, NJ prior to settling in Fair Lawn 67 years ago. She was a faithful parishioner of St. Anne RC Church in Fair Lawn and was a member of their Rosary Society. Maureen was a member of the Live Wires in Fair Lawn and the Brownstone Quilters in Glen Rock. Maureen was inducted into the Benedictine Academy Hall of Fame for community service. She was the recipient of the Jefferson Award given by the Governor for her community service and volunteerism. Along with her late husband John they received the Archdiocese Lifetime Service Award. Maureen will be sorely missed by all who loved her. Prior to retiring, she was employed as an Accounts Payable Associate with Vornado Inc., Garfield, NJ for 11 years. Beloved wife of the late John D. Morrison. Loving and devoted mother of William Morrison and wife The Honorable Margaret Foti, Joseph Morrison and wife Susan Triggiani. Stephen Morrison, Mary Anne Lund and husband Peter, Maggie Feeney and husband Robert and the late Donald Morrison and surviving spouse Nydia. Cherished grandmother of Paul Triggiani and wife Kristen Herrmann, Evan Feeney and wife Mary Kate, Jill Feeney and fiancée Joseph Caniglia, Thomas Feeney, Spencer, Austin, Brian, Julia, Jeffrey, Christina and William Morrison and Michael Morrison and wife Jennifer Fernandez. She is also survived by her loving caregiver Slava. The family will receive relatives and friends on Monday, July 16, 2018 4-8PM at Vander Plaat-Caggiano Funeral Home Inc., 13-31 Saddle River Road, Fair Lawn, NJ 07410 201-797-3500. A Funeral Mass is planned for Tuesday 10:30 AM at St Anne R.C. Church, 15-05 St. Anne Street, Fair Lawn, NJ 07410. Cremation will be private. In lieu of flowers donations in memory of Maureen may be made to Eva’s Village, 393 Main Street, Paterson, NJ 07501 or Oasis-A Haven for Woman and Children, 59 Mill Street, Paterson, NJ 07501. Maureen was a very special lady and I will miss her. I enjoyed getting to know her via mutual friends and quilting. Always positive and smiling, she was a joy to be around. I used to love seeing her walk the family Bassett hound down the street when she was watching him. I’m sorry for your loss and that I was out of town and missed the services. God Bless her and I know she’s in heaven smiling down on all of us! Heartfelt condolences to your family.